If anyone accuses the A-League of lacking drama and the unpredictable, they might need a medical referral and a thorough head examination. 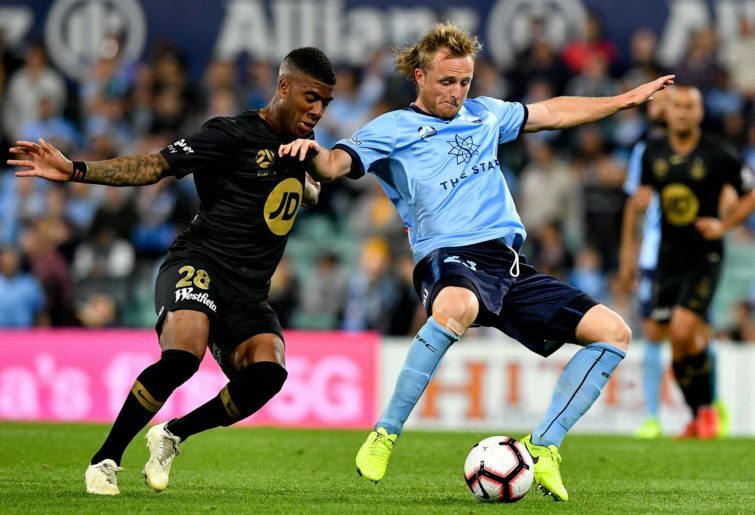 It was another ripping round of football for a rejuvenated Newcastle Jets, another second-half collapse by the Mariners and a Brisbane Roar performance that has stretched their fans’ patience to breaking point. Here are the men who made the difference in Round 17. In what was a tough weekend for goalkeepers Kurto produced another excellent display against the ladder-leading Glory. Without him Wellington would have conceded five or six. The Pole is in top form and saw an increased volume of shots come his way thanks to some absent Phoenix defenders. 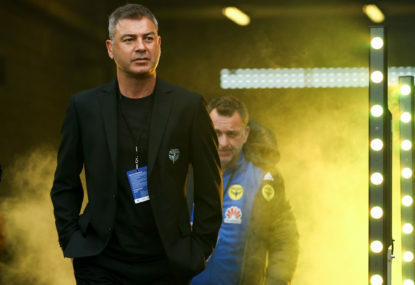 That made for a less than typical performance from Mark Rudan’s men at the back, yet Kurto did all he could to repel the rampant Glory. When we have all had a few more days to work out exactly what happened at Coopers Stadium on Saturday night Hingert’s game will still stand out. It was a perfect performance to highlight the modern role of the wing-back. Working the right and handling the danger of Craig Goodwin well (aside from a dubious free kick that led to Isaias’ goal just before the break) Hingert threw countless balls into dangerous positions for the Roar before calamity struck and the Reds pulled a rabbit from their hat in a controversial game. I expect to see Lowry pop up more and more often with goals like the header he produced to open the scoring for the Glory on Saturday night against the Phoenix. As his confidence at the back grows and Perth continue to show off their newfound strength in defence under Tony Popovic, the defender will no doubt drift forward more often and provide another dangerous attacking option. 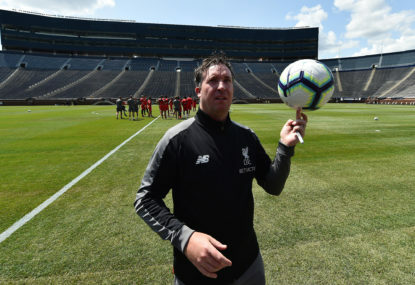 Perth have quite a number of those, and with men like Lowry doing their job at the back as well as offering something in attack, they now must be one of the favourites for silverware. Socceroos duty seems to have sat well with the man-mullet. Grant was at his best at Jubilee Stadium as he bounced and bludgeoned his way down the right side, taking control of almost every situation that was presented to him. For all the criticism slung his way, Grant is a star and produced another energetic and vibrant performance against a team that could learn a lot from the speed at which he plays the game. While it may appear a little strange having a defender in the team of the week whose side conceded three goals, Rowles was outstanding against the Victory on Saturday afternoon. With a little more help from those around him, the Mariners may have been better able to repel the visitors’ attacks in the second half. It is important to remember that the 20-year-old is still learning his craft, and the natural sense of timing and astute decision-making he possesses at such a young age bodes well for his future. While I would never place Sydney FC’s marquee as a No.6, he slots into one of the three midfield spots in this team of the week on the back of a stellar performance. 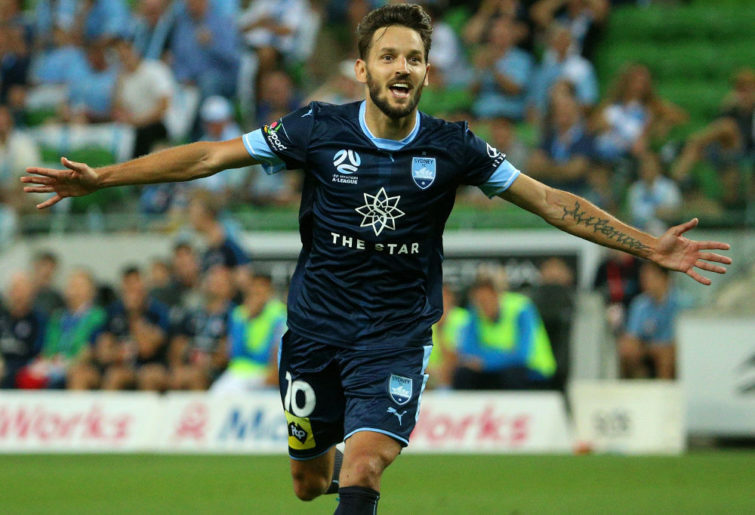 There are signs that as Sydney grow in confidence and start to get important members of their squad back on the pitch, the Serbian is also beginning to produce a consistent excellence that was missing earlier in the season. His deft passing played a role in Sydney’s best moments on Sunday afternoon and some of his midfield work was exquisite. Disregarding the predictable and catastrophic demise of the Central Coast in the second half against the Victory in Gosford, the early portion of the game was incredibly encouraging for the home side. Hoole struck twice with two stunning free kicks that gave Lawrence Thomas no chance and sent the Mariners to the sheds with a two-goal lead. Combined with the frantic pressure he applied through the middle of the park, Hoole played a polished game despite the Victory cutting the homes side’s defence to pieces in the second half. Even Jets fans were getting a little tired of waiting for their champion midfielder to show even a glimpse of the form he produced last season. It took a wet and soggy night at ANZ Stadium and the basket case Wanderers, to finally provide the perfect conditions for a masterclass. The 26-year-old reminded us all of why he earned a Socceroos cap in 2018. 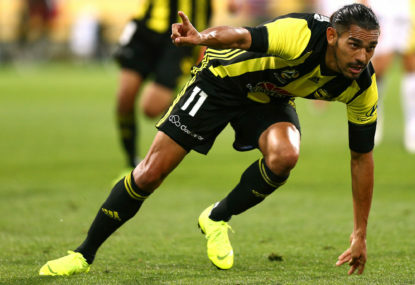 While his goal to open the scoring was stunning, it was his consistent and energetic play that set up numerous chances for the visitors and provided plenty of headaches for a leaky Western Sydney defence. As I sat with a friend and watched the Sydney vs City clash late Sunday afternoon his only comment when Le Fondre found the net in the 86th minute was, “Class”. He could see the clinical efficiency of the Englishman and appreciated his ability to hit the scoreboard so regularly this season despite the Sky Blues not creating copious chances on goal. 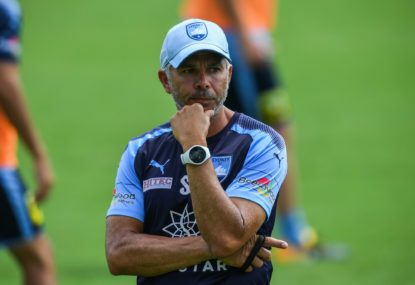 It is that efficiency that has kept Sydney FC still in the hunt for the premier’s plate. With the Glory travelling so well early in the season and the Spaniard out of the side with injury, Tony Popovic would have placed much thought into just how to blend Castro into his squad. With Chris Ikonomidis, Andy Keogh and Neil Kilkenny building such a wonderful rapport, there was a potential issue. That issue has been well and truly resolved, with the little man scheming and in total control against the Phoenix on a night when the potency of the Glory attack was well and truly on show. The little man was the most influential player on the park by the proverbial length of the straight when the Victory clicked into gear against the Mariners. After a slow start to the match, the second half became typical Victory as they built chance after chance and found the net three times. 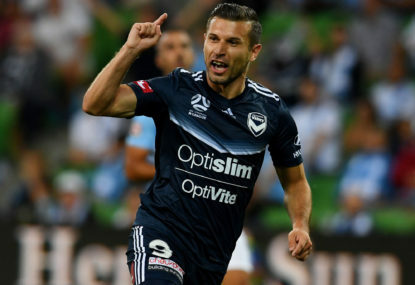 Barbarouses’s late goal sealed the fate of the Mariners and his runs on the right were influential in pressuring the home defence and creating opportunities for Kenny Athiu and James Troisi in the centre.